The United States Congress designated the Bosque del Apache Wilderness (map) in 1975 and it now has a total of 30,427 acres. All of this wilderness is located in New Mexico and is managed by the Fish and Wildlife Service. On a quiet day in November you'll hear the haunting cry of sandhill cranes echoing across the marsh and grasslands of 57,191-acre Bosque del Apache National Wildlife Refuge. Amazing to think that in 1939, when the refuge was established, the crane count averaged a sobering 17. That figure has since soared to 12,000. Add to that impressive tally 70,000 snow geese, 40,000-plus ducks (at least 14 species), Canada geese, Gambel's quail, roadrunners, and more than 300 other winged species and banner birding is a given. However, Bosque del Apache isn't just for the birds. Other residents included mule deer, coyotes, javelina, and western diamondback rattlesnakes. The refuge, is split in two by the hushed flow of the Rio Grande. The Bosque del Apache Wilderness, found within the National Wildlife Refuge, is split into three distinct units. They are the 5,429-acre Chupadera Unit, all refuge land west of Interstate 25; the 5,139-acre Indian Well Unit, just across the interstate from the Chupadera Unit; and the Little San Pascual Unit, which covers 19,859 acres just east of the Rio Grande. 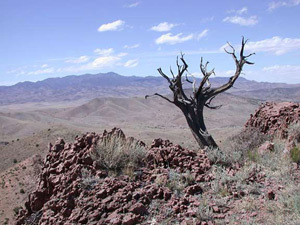 The three Wilderness units hold in common a lack of water, but otherwise offer distinctive terrains. Arroyos divide the Chupadera's series of small ridges and mesas, while Indian Well has round mountains along its western side and arroyos and mesas on its gentler eastern side. The largest unit rolls gently across desert terrain, sharpening to a peak at Little San Pascual Mountain. Day hiking is allowed, however camping and camp fires are not permitted. Planning to Visit the Bosque del Apache Wilderness? How to follow the seven standard Leave No Trace principles differs in different parts of the country (desert vs. Rocky Mountains). Click on any of the principles listed below to learn more about how they apply in the Bosque del Apache Wilderness.